Keeping up with changing technology is a struggle for any industry. With numerous online resources, mobile applications and tablet computers at their disposal, many control states are looking to modernize their systems and streamline internal and external processes. Investing in online platforms for licensing and training programs is one way to improve overall productivity and better serve licensee customers in the process. StateWays checked in with three states to review the progress in these areas and collect tips to share with other agencies that are gearing up for this process. In July 2013, Montana’s Liquor Control Division, administered under the state’s Department of Revenue, began the process of overhauling its online licensing system. The decision to do so was prompted by Governor Steve Bullock’s Main Street Montana Project, which focuses on providing better service to customers. It was determined that an online licensing system would provide both convenience and better service to Montana’s liquor licensees. Previously, the only way for someone to apply for a liquor licence in the state was to fill out a paper application that was roughly 20 pages long. Montana partnered with Fast Enterprise (the same company that manages the state’s warehouse distribution system) to create a new online application, simplifying the process. In addition to accepting new license applications, Montana’s system allows users to pay for their license, renew their license and report any licensee changes online. One thing it doesn’t do is allow applicants to upload their fingerprint cards, which are required in order to conduct mandatory government background checks for all licensees. The fingerprint cards must be mailed in separately to complete an application. Users also have the option of mailing in additional information that may be cumbersome to upload into the system directly, such as location blueprints. Montana spent about a year planning and rolling out the new online licensing system, initially offering it to on-premise applicants in January 2014 and including manufacturers and special permit requests as of Summer 2014. Prior to its launch, the system was thoroughly tested by some of Montana’s top licensees, who offered essential feedback on features and usability. 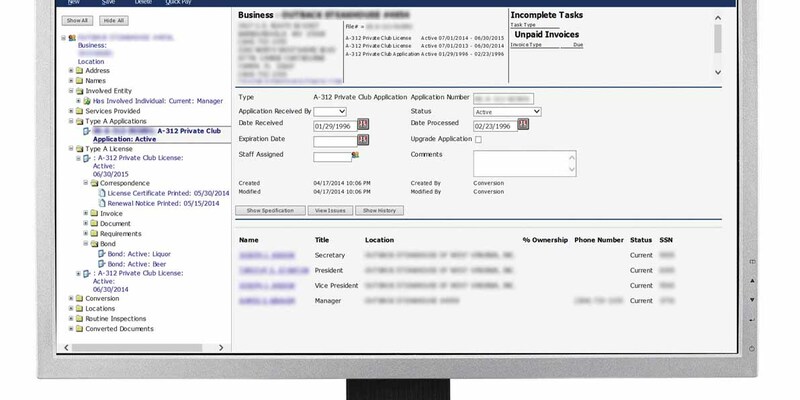 The system cost approximately $200,000 to set up, and Helfert estimates that about 25% of new applications are currently being submitted using the online process. Applicants still have the option of sending all their information through the mail, and there’s no plan to phase the paper applications out over time. 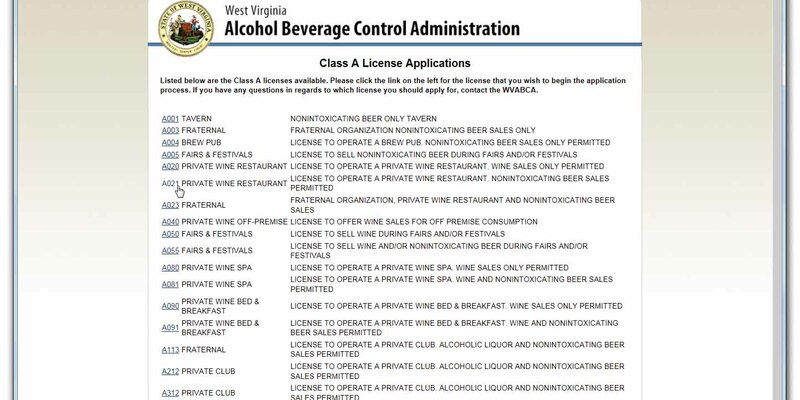 Since 2011, the West Virginia Alcohol Beverage Control Administration (WVABCA) has been hard at work planning to completely overhaul seven legacy systems. This charge came directly from WVABCA Commissioner Ronald Moats in an effort to utilize technology to improve operational efficiency across departments. One component of this lengthy project included updating the state’s online licensing system. A primary goal of the project was to develop a system that could easily be accessed from anywhere. To begin the process, the WVABCA collaborated with its state’s central office of technology. After some initial development, the project was brought back within the agency, and the company GL Solutions was contracted to execute the new program. Working with the WVABCA, GL Solutions customized its GL Suite software to meet the agency’s specific needs. Developmental planning for the new program began in Fall 2013, and the back office component of the system launched in April 2014. By June 2014, the system was accessible via a website application and mobile inspection devices. And the rollout isn’t yet complete. The decision to roll the new system out in multiple phases was made in order to minimize any potential disruptions. Easing into the launch slowly has also allowed WVABCA to spend time working with their partners at GL Solutions to make sure the software is customized exactly the way they need it to be. “This agency spent a lot of time thinking about their business development and about how our software would meet their needs, and they did a good job of articulating those needs to us during each step of the process,” says Jake Burts, Sales and Marketing Manager with GL Solutions. Even though the new online licensing system isn’t fully operational, Robinson reports that the agency’s overall functionality has already improved dramatically, thanks to the integration of iPads with the new mobile interface. In addition to streamlining online license application and renewal processes, some states are using technology to expand their seller and server training programs. In 2010, the Maine Bureau of Alcoholic Beverages and Lottery Operations received a grant from the National Alcohol Beverage Control Association (NABCA) to create an online training program, which was to be the first of its kind in the state. Although the city of Portland, Maine, is the only town that requires seller/server training certification, such education is popular throughout the state, and a certified online program was developed to make it easier for the masses. “Before the online training was an option, people had to travel quite a ways or wait a while to sign up for classroom training, which is why we recognized this need,” says Johnnie Meehl, Manager of Spirits Operations with the Bureau of Alcoholic Beverages. The online training program took approximately nine months to develop and test, and it officially launched at the end of 2011. To date, Meehl estimates that roughly 2,500 people have completed the training program online, which amounts to approximately 25% of all seller and server training certifications in the state. Meehl admits that the program was slow to catch on at first, but the state has partnered with an advertising agency to help get the word out that there is now an online alternative to classroom training. Additional enhancements to Maine’s online training program may be forthcoming. Some users have indicated that they’d like the option to purchase a corporate account in order to funnel groups of multiple employees through the training. Currently, the system is set up so that users must register individually. Think long-term. Online systems take time to develop, test and roll out to the public. Don’t expect a quick fix. Take the time to work slowly to make sure you get it right. Don’t automatically select the cheapest option. When partnering with an outside vendor, remember that not all products are created equal. Every agency is different and requires a different set of tools to meet its unique organizational needs. Vendors should be evaluated on quality and customization options of the product, as well as overall cost. Consider internal and external needs. Online systems will ideally simplify your in-house processes, but should also make life easier on the people your agency serves. Prior to investing in a new online system, consider doing focus groups with licensees, sellers and servers to see what they’re looking for in an online program. Be mobile-friendly. Take the extra steps to ensure that your new system will be easily accessible from mobile phones and tablet computers.